The Kingdom Hearts Series combines the universe of Final Fantasy and the world of Disney. Everyone was shocked and disturbed when the original game was announced because of it was such an odd combination. However like Peanut Butter and Jam, the strangest pairings are often the best. Kingdom Hearts is no exception to that rule. Here we are at the prequel to the original game. While fans of the series are waiting for the third (and final?) installment of the main series they are being abated with a number of spin offs. After a lackluster attempt on the Nintendo DS, skepticism was thick for the PSP title. I myself was worried I would be a bit disappointed again by another Kingdom Hearts spin-off game. 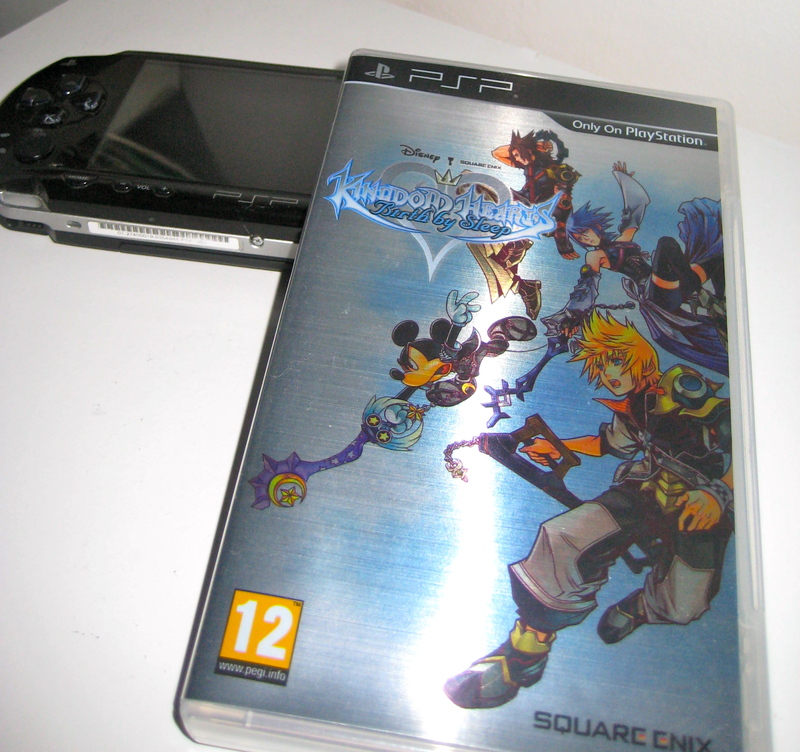 The series creator and champion, Tetsuya Nomura assured fans that Birth By Sleep is “Chapter 0” rather than a spin off. After spending nearly 40 hours on the game, I am inclined to agree with the man. You choose to play through the game’s story as one of three characters – Terra, Aqua or Ventus. In order get a full understanding of the story you have to play though all three characters. I was immediately worried at the thought of playing through the game three times over, since Kingdom Hearts 358/2 Days on the DS was comprised of playing mission after mission in the same areas over and over again. I was pleasantly surprised that I can count the repeated sections for each character on one hand. Even though you visit the same worlds with each character, there is are different areas, allies or enemies to be discovered. The three character structure also makes the story telling richer and and more involving. After playing through the story with one character, I immediately started into the next. I was eager to fill in the gaps, investigate the crossed paths and alternate angles with each character. As far as I’m concerned this installment in the Kingdom Hearts series has the best story. It is simple and easy to follow, yet fairly captivating at the same time. It is amazing that the creators have managed to set up the next chapter in the main series, (as yet unannounced) Kingdom Hearts 3 with a prequel story. For those familar to Kingdom Hearts, the gameplay is nothing revolutionary and those who are new to the series should be prepared for the fact it isn’t the most deep battle system. However bosses are fun to play against and the camera isn’t a troublesome as it has been in previous chapters. Platforming is on the light side, so there isn’t any irritation there either. Birth By Sleep is definitely the strongest title outside of the main series. It should be regarded as Kingdom Hearts 0. Any fan of the series cannot afford to miss this title and anyone on the lookout for a strong PSP title shouldn’t ignore it. This entry was posted in Video Game and tagged Aqua, Birth By Sleep, Kairi, Kingdom Hearts, Kingdom Hearts 3, Mickey, PSP, Riku, Sora, Terra, Ventus by Jonathan Day. Bookmark the permalink.